There is always something happening at Pono! 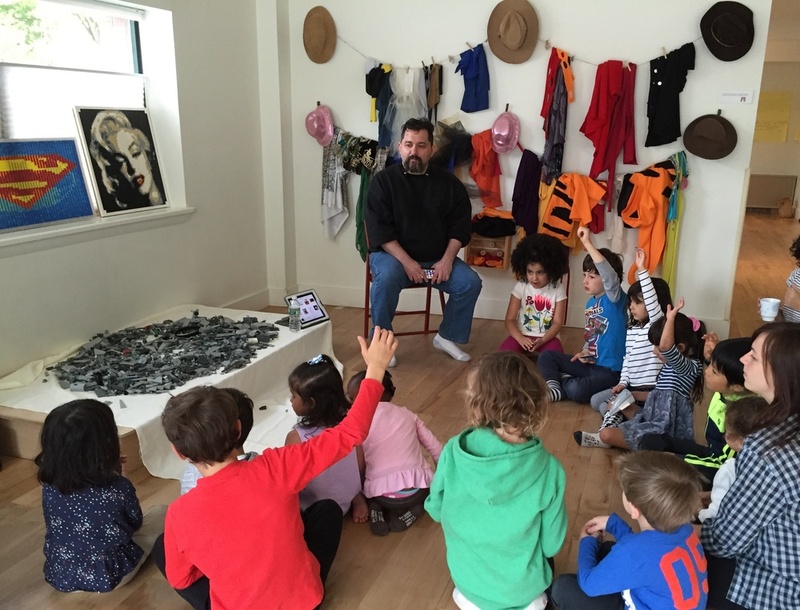 Read about our field trips, visiting teachers, classes, and special events. 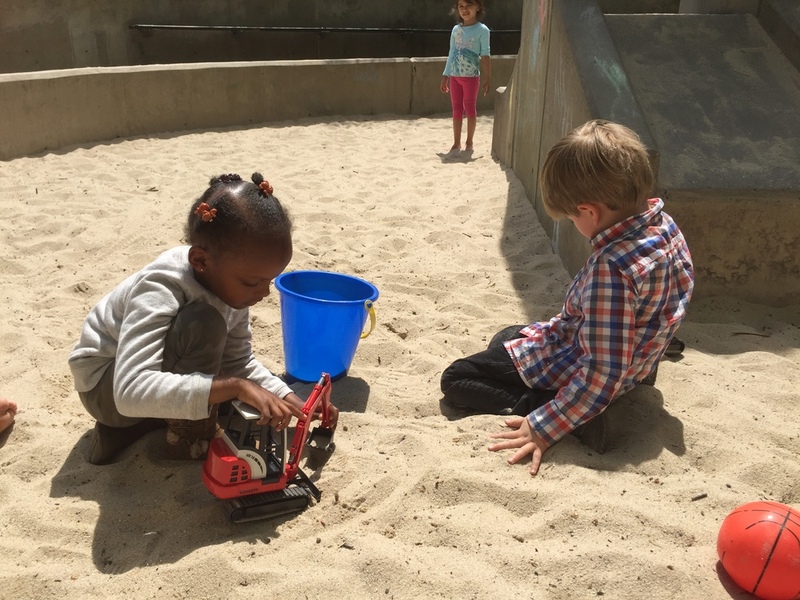 Our spring term continues to provide plenty of opportunities for wonder and discovery! Lego artist-for-hire and designer Cody Wells of C3Brix visited Pono this week. Cody showed us several of his Lego mosaics and shared how he has literally built a career out of playing with Lego. He delighted the children by covering one of our stages with millions of tiny plastic bricks and inviting them to play. Cody offered tips and suggestions for Lego construction but emphasized the power of the children’s imaginations. It is inspiring to see what creativity and a lot of little bricks can do! Actor Makiko Miyai returned for another showtime with our younger Pono friends. 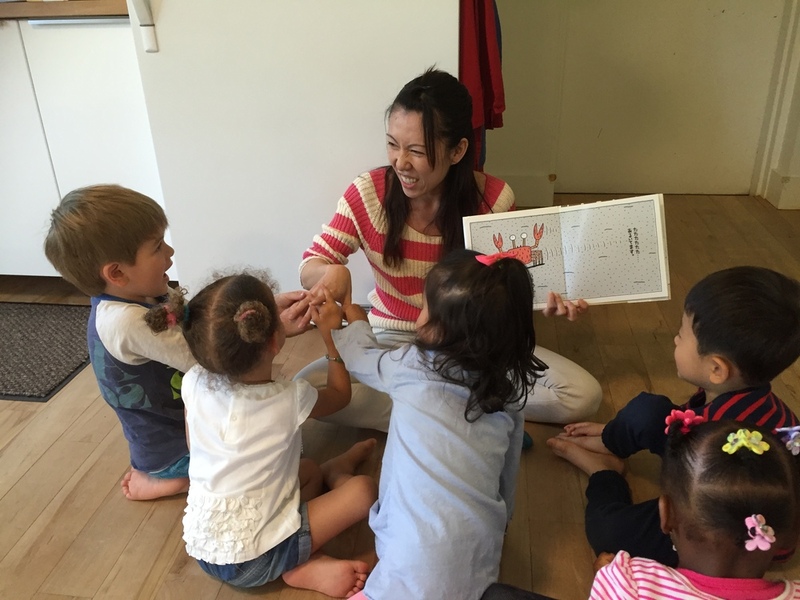 She and the children acted out various animals, played with origami puppets, and sang like frogs in both Japanese and English! 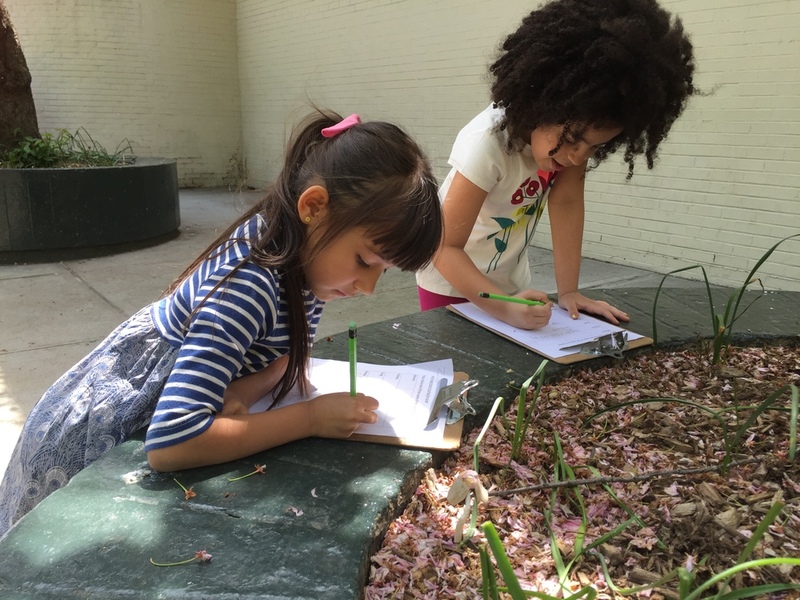 The older children and Dr. A honed their classification skills and embarked on a “Five Kingdoms Scavenger Hunt” in Marcus Garvey Park. They searched for examples of life from each kingdom and noted the specimens they found. The discovery of fungi proved especially exciting! Pono parent and yoga instructor Eric Stoneberg returned for another yoga session with the children in Marcus Garvey Park. He gave each child a new meditation stone–sodalite, a beautiful deep blue mineral. 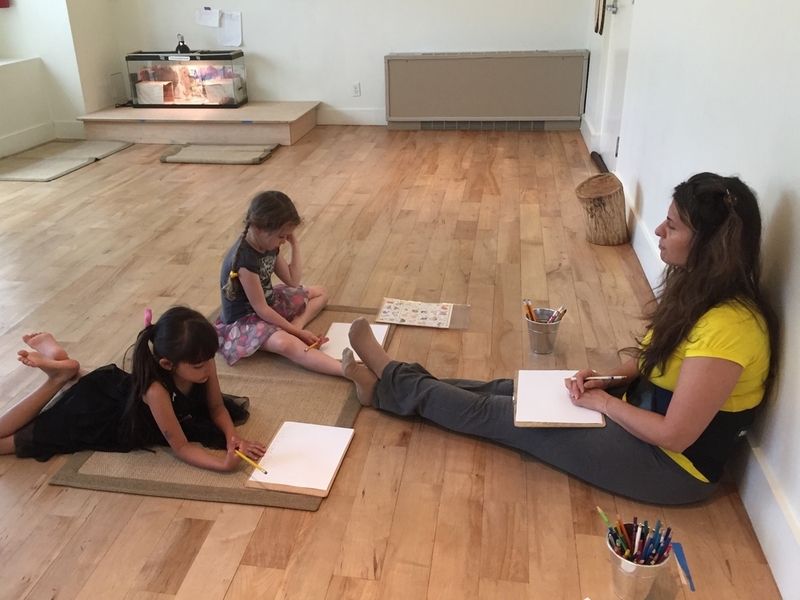 Meditation and yoga allow the children a quiet, mindful time to "recharge." This week Dr. A and the younger children dissected owl pellets. They worked intently on extracting tiny rodent bones and were thrilled with each discovery. This week in literacy with Julietta one group finished their Where They Come book. We welcome you to read it! The young authors/illustrators presented some very interesting ideas and stunning drawings. The other literacy group focused on rhyming poems this week. They performed and analyzed several free verse and metered poems containing rhyme, written by more local artists. They were also excited to experience the connection between poetry and song. It was an absolutely electric session! Maysaa and the younger math group played “Doubles Bingo.” The children rolled a die and had to double the number, with the help of another die with the same number they had rolled. They then looked to see if they had the number on their Bingo card. This week in math the older children and Maysaa focused on the relationship between addition and subtraction and the big ideas of commutativity and associativity. The older children practiced blending their voices with Ali as she played her guitar. Their rousing version of the traditional bluegrass song “Red Rocking Chair” filled the Pono space with joyful harmonizing. The younger children painted wooden vehicles with Ali and especially enjoyed mixing paint to make new colors. All aboard the art train! Kate and the younger Pono children explored emotions in Spanish. They acted out various emociones and demonstrated some very expressive faces! The amigos also made emoji stick puppets to practice new vocabulary terms feliz (happy) and triste (sad). Some of our younger Pono friends joined Kate for a walk through Marcus Garvey Park to spot exhibits from the current FLUX Art Fair. The theme of this year’s fair is “Changing Landscapes,” and the children delighted in discovering how the artwork transformed the park’s familiar terrain. The children found artist Bayeté Ross Smith’s “Got the Power: Boomboxes” sculpture particularly intriguing. 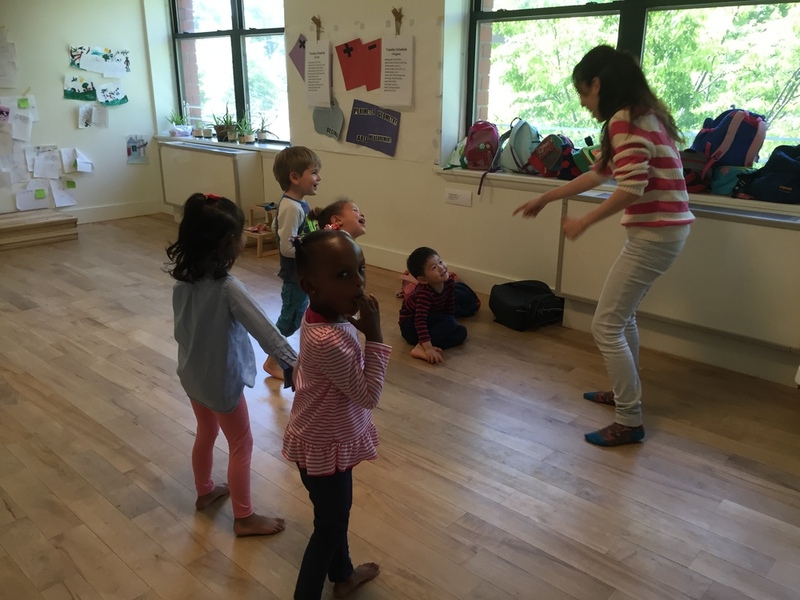 Music with Ali can inspire friendly hugs, as well as singing and dancing! We started our week with a trip to the Brooklyn Center for Performing Arts at Brooklyn College to see “Mexico Beyond Mariachi: Cinco de Mayo Celebration.” Musicians played traditional pre-colonial instruments and dancers performed in colorful costumes in this vibrant production of Mexican history and folklore. Art historian Meglena Zapreva returned to Pono for a lesson on samurai. She gave us background information on these warriors before we all headed to the Metropolitan Museum of Art for more in-depth exploration. 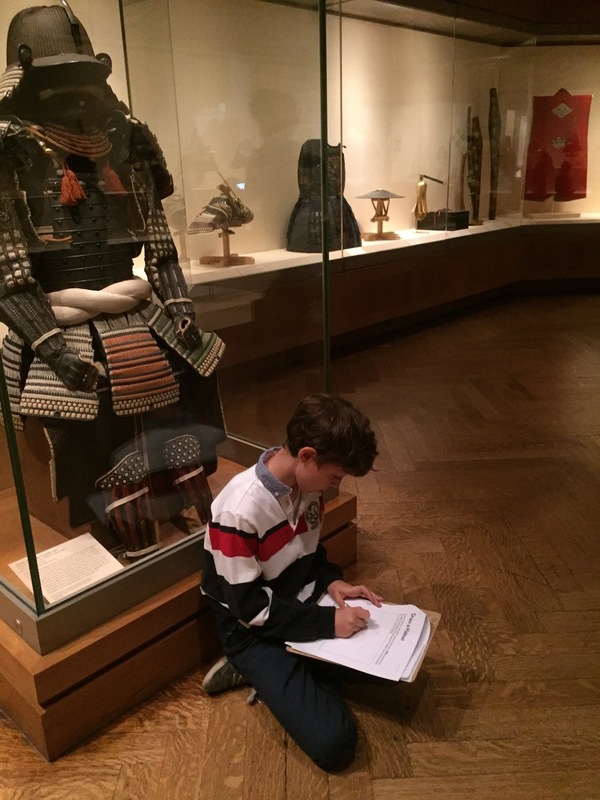 We compared traditional European armor and samurai armor, and the children sketched details from various samurai helmets. Meglena asked the children to observe the expressions on a collection of masks and then invited them to strike their own poses. Look at those fierce stances! Our young samurai also had time to play in Central Park's Ancient Playground. The comic book group met with Julietta this week. The superheroes joined forces to begin work on Chapter 7 of their comic book, the penultimate chapter! The resolution to their saga is in sight! The songwriting team and Poppy Luca put the finishing touches on some of their scenery. A large whimsical mushroom has sprung up in the Pono space! Earlier this spring Aziza from Def Dance Jam Workshop reached out to Pono to tell us about a performance piece she had created that explores the Hawaiian concepts of pono. On Saturday Aziza presented her production “Pono...Harmony Restored” in the Pono space. Her powerful dramatic performance featured singing, drumming, and dancing. During the intermission, Pono student Zoë explained why Pono is important to her and invited the audience to plant seeds in our vertical garden. Each seed packet had a word the older Pono children had selected and written earlier in the week because they felt it exemplified pono. Harmony, balance, goodness…What does pono mean to you? We hope you are finding pono in your journey!